Hello Everyone. I am in transition mode…in several ways! Since it is the end of November, time to put away all of the fall décor and bring out some Christmas cheer! Before I dive into my numerous bins and boxes of holiday décor, I want to talk about another transition. As I shared with you in this post, I have recently started a dream venture of going into business with Carrie Clayden of Hip Chick Designs. I am currently working in the shop part time, and have signed on to help market and promote the retail side of this amazing art studio/gift shop located in Benicia Ca. This incredible opportunity will also bring some exciting changes to my blog! Starting this week, I will be featuring items that we are selling in the shop, and make them available to all of you. Since lots of you are too far away to be able to come on over and browse in our shop in person, you will now have the chance to see, and buy, some of the beautiful hand made, hand painted, re-cycled, re-purposed, and hand selected items we fill the shelves and aisles with at Hip Chick Designs. 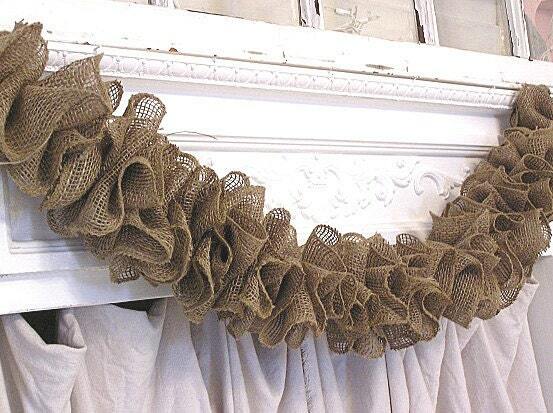 This beautiful garland is hand made from 6 inch wide burlap ribbon edged with a white finishing stitch. It comes in 6 foot lengths with a loop on each end for hanging. Use on your tree, as a swag on your mantel, framing a doorway, or running down the stair banister mixed with natural greenery. Not only useful during the holidays…it can be used all year long to add some texture and whimsy to any party or occasion. As our introductory offer (perfectly timed on Cyber Monday! )…each 6 foot garland is currently priced at $25.00 + shipping. This is less than half the price I found at several online sites and sources. I am so excited to be able to offer all of my Elegant Nest followers, and visitors, items from our shop! I look forward to hearing from you about this new feature. Please contact me with any questions or for more info about any of the items shown and how to place your order. Finally, I want to thank you all for the support and positive feedback I have recieved over the last few months. Starting this blog has been a blessing that I am so thankful to have. The blogging community is one of the most supportive and fun groups I have ever been involved with. I am excited to see where this new venture will take me and how this creative endeavor will expand and grow! Good for you and I hope everything is going well. The garland is so pretty. If you lived in PA, I'd share your new venture with my PSMM group. There are a few of us design type folks in my group but not many so it's always nice to support one another.